Insolvent. Nowhere to live and no tools to gain an income. This was a devastating moment for Robert Beeston and his two small sons. He had lost his beloved wife Elizabeth to heart problems in May 1866 and now just two months later everything they had worked for was gone. How could the family survive when his home in Fortitude Valley, all his household goods, all his timber and all his carpenter’s tools were to be sold off at auction? Robert was no stranger to tragedy and though his situation seemed to be beyond hope he undoubtedly could turn to the community closest to him. He was a staunch member of the Primitive Methodist Chapel in Fortitude Valley – surely they will be generous in their offers of help. Several cousins had also made the journey from Stockport to Brisbane – perhaps James, Mary, Joseph and Matthew could help. After all they live in Brisbane too. Still, they are just getting established having arrived only last year and, except for James, are quite young. Elizabeth’s parents and sisters had also arrived in Brisbane in 1865. Why didn’t I think of them first? When Elizabeth and I came to Brisbane we had to leave our little Johnny with them for two years. He knows and loves his grandparents and his aunts. They might be our best hope to get through this trying time. We will survive! And survive they did. 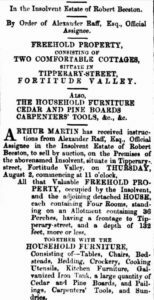 Note: The “advertisement” is an Order from the Official Assignee (Alexander Raff) of Robert Beeston’s insolvent estate to sell by auction all his freehold property, household goods, carpenters’ tools etc. Apart from newspapers giving details on insolvencies – sometimes revealing all the possessions they owned – it is worth examining the relevant Government Gazette and then following up at the appropriate archive. This can reveal much more about the person than you will find just using online indexes.